South African Jacques Rudolph is ready to make his Glamorgan debut believing the county have the credentials to get into the Division One. After missing Glamorgan's opening victory over Surrey he will play the four-day game with Gloucestershire in Cardiff starting on Sunday. Rudolph was absent for the first game as he was competing in an Ironman race. "I think we do have the firepower to get ourselves in the first division," said the 32-year-old. Despite Glamorgan finishing second from bottom in Division Two of the County Championship last season Rudolph believes the squad have what it takes to turn their fortunes around. "They [Glamorgan] are a very respectable team. I can see there is a very strong professionalism and dedication towards a good work ethic," said the 48-times capped Test star. "It's a nice environment. From what I have heard Toby [Radford] has been brilliant as a coach and you can see the guys are really focussed and professional. "There is a lot of experience [in the side] and there are game-breakers in people like Jim Allenby. "I was very glad to see that [the win over Surrey]. I think it's a great start for the guys. I think we have a good blend. "In my previous county experience it's important to try and get momentum and I think it will be good for us if we can get two or three wins under the belt. "Just to give the guys that confidence that we can go through and push for Division One." Rudolph, who revealed he will bat in the top three, knows there is a lot expected of him and veteran Murray Goodwin in the batting department. 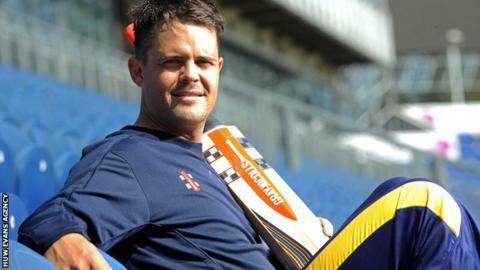 "I think it will be important for myself and [Murray] to lead the batting line-up and get the bulk of the runs," added Rudolph who has signed a two-year deal with Glamorgan. "At the end of the day I was signed up to try and lead from the front and hopefully we can get ourselves in good positions where we have enough time to bowl teams out and win games like that. "It's always good to gather early momentum. It will be good for me to try and spend as long as possible at the crease and get used to the conditions again." Hear the full interview with Glamorgan's star signing Jacques Rudolph on Radio Wales Sport from 19:00 BST on Tuesday, 15th April.